We often get asked about what mission rewards come with added extras, bonuses or special actions... so, we've made a full list separated up into three stages. The first set are decorations with a SPECIAL action, something that gives out a reward above and beyond the norm. The second set give collectibles, the third is just a list of those items that give (often paltry) amounts of coin and XP. Each contains a note of what they give and where they came from. 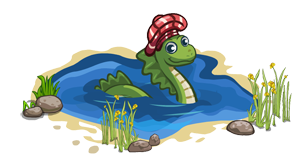 PLEASE NOTE: This list contains bonus drops, for decorations with a fishing mechanic, see HERE. Set One - These items have a special bonus above and beyond the usual drops. 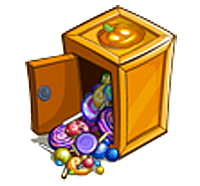 Candy Safe - Can drop Marshmallow, Cotton Candy, Candy Corn, Gumdrop, Spearmint or Licorice Crops. 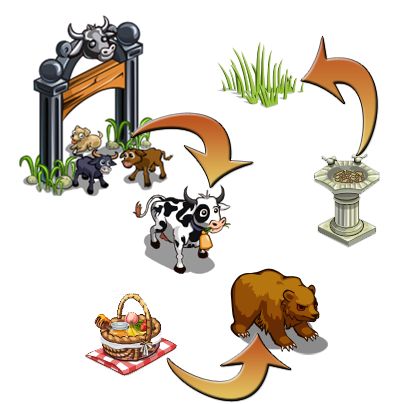 Cattle Drive Banner - Tended for 500XP and a Cow Ready Boost - Also has a chance to drop a Cow of any kind. City Wardrobe - Provides 25 extra Stuffed Bear Storage. Came from: Git Ready For The Long Haul - This is an expired Timed Mission and no longer available. 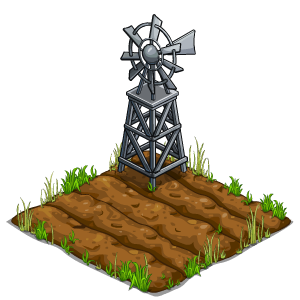 Crop Generator - Tended for 100XP, 100 coins and 2 Crop Tokens. Contains the Crop Market. Easter Garden - Drops 150XP, 150 coin and 2 Crop Ready Boosts. Easy Bake Oven - Tended for a Snack Meal. Fancy Burrow - Can drop Valerian Crops, Hibernation Kits, Warm Jammies, Gold Dust or a Dream Boost along with Sweet Dreams Collectibles. 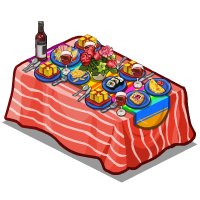 Fiesta Table - Can drop any energy meal item. Fortune Frog - Can drop White Water Lillies, Pink Water Lillies, Hosta Flowers, Pond Parcels, Soothing Spots, Slippery Spirit, Frogs Legs, Steel Forges, Recycle Bins, Rubber-Root Dandelions, Seive Stations, Hide Prepping Stations and Frog Haven Collections. Frontier Flag - Drops one of Silk, Steel Forge, Washbin, Brussels Sprout, Gold Dust, Crop Token, 10 Energy. Goat Tower - Drops one of Quinoa/Buckwheat, Goat Ready, Goat Allure, 3 Energy. Gun Wrangler Super Stunt - Can drop one of Fry Crop, Cotton Candy, Popcorn Kettles. Haunted Hovel - Reward information HERE. Jack's Podium - Drops one of 5 Energy, Brussles Sprouts, Spider Flowers, Barbecue Crop, Cattle Power, Veto, Pardon, Animal Edible. Mineral Spring - Replicates Crops, all info HERE. Mini Golf Course - Drops one of Devil's Club, Golf Club, Club Handle, Gold Dust. 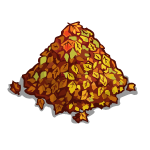 Money Bags - Drops one of 10 Gold Dust, 10'000 coins, Poison Ivy Crop, Goldenrod Crop. Also drops Train Robber Collectibles. National Park Sign - Can drop 5 Energy, Wood Lily, Wild Buttercups, Algae Pool, Bird of Paradise, Sunny Poppy. Scrooge's Shop - can drop Memorable Scent, Brave Butterflies, Festive Cinnamon, Buddlea, Winterberry, Golden Sheep, Future Contraption, Bag of Money, Overflowin Bank Chest. Snoozing Granny - Can drop Valerian Crops or Sleepy Tea along with Sweet Dreams Collectibles. Solid Gold Dance Floor - Daily Bonus can drop Wood Lathe, Red White and Blueberry, Red Essence Lab, Recycle Bin, Hide Prepping Station, Red Pineapple, Gold Forge, Basket of Gold, Black Eyed Peas, Devil's Claw, Festive Cinnamon, Grog, Rubberroot Dandelion, Sesame. Spirit Bonfire - Drops crops, some of Spirit Flames, Honeydew Melons, Gold Forges, Freezing Pumps, Sieve Stations, Recycle Bins, Lavender, Blackberry Bushes, Spinach. Tainted Table - Reward information HERE. Team Frogs - Can drop Pond Parcels and Frog Haven Collections. Termite Mound - Drops one of Pitcher Plant Crop, Delicate Net, Bug Habitat, Paper and Glass or Unwither Crops Boost. Also drops Exotic Bug Collectibles. Tesla Coil - Drops one of 10 Energy, Green Lightning, any colour Essence Lab. Treasure Trove - Tended for 200 coins and 200 XP - Drops Redemption Collectibles and a possible drop of Rye crops and Boiled Shoes energy meals. Molten Cake. Also switches on and off Falling Ash homestead effect. Witchy Wardrobe - Reward information HERE. 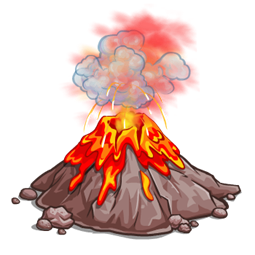 Wonderous Spring - Can Drop Cleaning Solutions, Testing Kits or Hot Spring Collectibles. 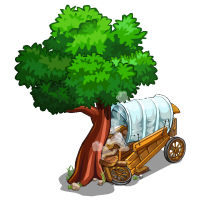 Wrecked Wagon - Drops one of 25 Energy, Heather, Grog, Valerian, Sunny Poppy or Grass. Set Two - These items drop Collectibles as well as (usually) XP and/or coins. Admissions Booth - Tended for 100XP, 100 coins and items from the Good Guy Gratchett Collection. 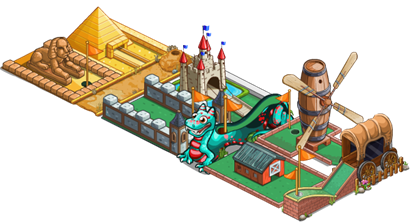 Bouncin' House - Tended for 15XP and 1'000 coins - Drops Third Year Anniversary Collectibles. Champions Manor - Tended for 100XP and 200 coins - Drops Dog Show and Premium Dog Show Collectibles. 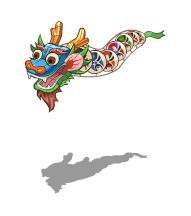 Dancing Dragon - Tended for 200XP and 200 coins - Drops Astral Tools Collectibles. Heroic Sissy - Tended for 150XP, 150 coins and items from all three Masked Lasso Returns Collections. 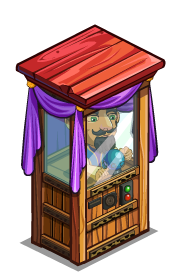 Inspector's Carriage - Tended for 100XP, 100 coins and items from the Inspection Collection. Log Roll - Tended for 15XP and 1'000 coins - Drops Third Year Anniversary Collectibles.